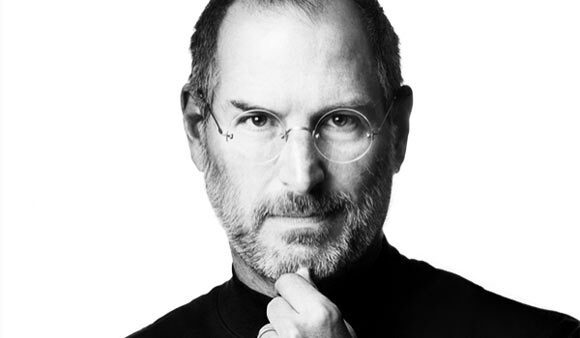 Steve Jobs was the world renowned founder and CEO of “Apple Inc“, the American multinational company that designs and sells electronics, software and personal computers. Steve Paul Jobs was born on Feb 24th, 1955 in California. He was put up for adoption by his biological parents and adopted by a lower middle class couple named Steve and Paula Jobs. From an early age Steve was interested in electronics and his best friend was an older kid named Steve Wozniak (also known as “Woz”) who, like him, was a whiz at electronics. Jobs briefly attended Reed College before dropping out. He attended some creative classes (including one on Calligraphy – a skill that later helped him in creating fonts for the Mac) and lived with friends. He also travelled to India on a spiritual journey and became a practitioner of Zen Buddhism. His first real job was as a technician at the video game manufacturer Atari Inc. After spending a brief period there, he pooled resources with Woz and started a company by the name of “Apple Computer Company” that initially sold circuit boards. Woz then designed the Apple I computer which Jobs set about selling. He also sought funds from potential investors, some of which included Scott McNealy, co-founder of Sun Microsystems, and Mike Markkula, a retired product manager of Intel. Soon after, they launched the Apple II, a user friendly and beautifully packaged personal computer that became a hit in the market. They hired top notch management personnel including John Sculley from Pepsi-Co to serve as CEO of Apple. Jobs became one of the youngest multimillionaires in the country when the company went public in December 1980. The company’s success attracted competition from giants such as IBM, who designed and manufactured the IBM PC as a response to the Apple II. In response, Apple started a project named Lisa, which Jobs was initially working on but later was kicked out of due to personality and opinion clashes with the others. He started working on his own project named the Macintosh (or Mac, as it became known) by forming his own team of brilliant, young engineers. The Mac was initially successful but sales plummeted a few months later. Job refused to acknowledge this and after some struggle with the Board of Directors and Sculley, he fired from Apple in 1985 and form his own company by the name of NeXT computers. At NeXT he developed specialized and highly technical machines for universities and businesses but with very limited success. He also bought the computer graphics division of Lucas films from George Lucas and named it Pixar. At first he aimed for Pixar to sell pricey computer graphics workstations but later the company turned solely to software and animation. Pixar had its first success by winning an Oscar for its short movie “Tin Toy” in 1989. Steve Jobs took Pixar public in 1995, right after the release of “Toy Story”. The movie was a phenomenal success at the Box Office as was the IPO of Pixar. Steve Jobs was now a billionaire as he owned 80% of the company. NeXT was acquired by Apple in 1996, and Jobs came back to the company he had created. The existing CEO was let go and Jobs took over as interim CEO. He was now managing both Pixar and Apple simultaneously. After his return, Jobs launched some of the most successful products that Apple had ever sold; first the revolutionary music player called the iPod and then the iTunes music store, iPod nano, mini, video and later the iPod touch, iPhone, iPad and iCloud. Each product is iconic in its own way and has millions of dedicated consumers hooked because of its easy to use and brilliant interface, smart functionalities, customization options and choice of apps, music and much more. Jobs was number 17 on the list of most influential people compiled by Forbes magazine in 2010. In 2010, his net worth was estimated at $8.3 billion, making him the 42nd wealthiest American at that time. Steve Jobs was diagnosed with a rare form of pancreatic cancer in 2003 and although he continued to work till 2010, his health forced him to step back in 2008-09. He briefly recovered and returned to work but eventually resigned as CEO of Apple in August 2011. He prepared Apple for the future by setting up “Apple University” which would help to groom future Apple executives. He put his personal affairs in order and hired a journalist named Walter Isaacson to write his official biography. Steve Jobs passed away the day after the launch of the iPhone 4S, on October 5, 2011.